This study aimed to identify the causative gene for HIV-1 associated nephropathy, a paradigmatic podocytopathy. A previous study demonstrated that transgenic expression of nonstructural HIV-1 genes selectively in podocytes in mice with FVB/N genetic background resulted in podocyte injury and glomerulosclerosis. In this study, transgenic mice that expressed individual HIV-1 genes in podocytes were generated. Five of six transgenic mice that expressed vpr developed podocyte damage and glomerulosclerosis. Analysis of an established vpr transgenic line revealed that transgenic mice on FVB/N but not on C57BL/6 genetic background developed podocyte injury by 8 wk of age, with later glomerulosclerosis. Four of 11 transgenic mice that expressed nef also developed podocyte injury. One transgenic line was established from the nef founder mouse with the mildest phenotype. Transgenic mice in this line developed mesangial expansion at 3 wk of age and mild focal podocyte damage at 10 wk of age. Mating with FVB/N mice did not augment nephropathy. None of the transgenic mice that expressed vif, tat, rev, or vpu in podocytes, even with the FVB/N genetic background, developed podocyte injury. For testing effects of simultaneous expression of vpr and nef, these two lines were mated. All nef:vpr double-transgenic mice showed severe podocyte injury and glomerulosclerosis by 4 wk of age. In contrast, all vpr or nef single-transgenic mice in the same litter uniformly showed no or much milder podocyte injury. These findings indicate that vpr and nef each can induce podocyte injury with a prominent synergistic interaction. Accumulating evidence indicates that podocyte damage triggers progression of glomerular deterioration that leads to glomerular sclerosis (1–10). However, the nature of podocyte damage that causes irreversible progression is poorly understood. HIV-1–associated nephropathy (HIVAN) is unique in that the etiology of podocyte injury is genetically well defined, namely the HIV-1 itself. Patients with HIVAN present with heavy proteinuria and rapid progression to end-stage renal failure with collapsing FSGS and microcystic tubular dilation (11–17). HIV-1 encodes three structural genes (gag, pol, and env), two essential regulatory genes (tat and rev), and four accessory genes (vif, vpr, vpu, and nef). Studies on HIV-1 transgenic animal models have provided important insights into the pathogenesis of HIVAN. A transgenic line, Tg26, that carries HIV-1 DNA that lacks gag and pol genes has been studied extensively and is characterized by nephropathy that is similar to human HIVAN (18). The transgene of Tg26 is driven by the endogenous HIV-1 promoter, which is expressed in a wide range of cells. Reciprocal renal transplantation between Tg26 and wild-type mice revealed that development of nephropathy is due to intrarenal expression of HIV-1 mRNA that is independent of circulating viral proteins or dysregulated systemic cytokines (19). Transgenic rats that carry the same construct as Tg26 mice also develop nephropathy, confirming that gag and pol are not involved in HIVAN pathogenesis (20,21). Moreover, the HIV-1 transgenic mouse line that lacks gag, pol, and nef develops FSGS, and genetic complementation with nef results in more severe glomerulosclerosis but less severe tubulointerstitial injury (22). Conversely, the transgenic lines CD4C/HIV and CD4C/simian immunodeficiency virus that express HIV nef or simian immunodeficiency virus nef, respectively, develop tubulointerstitial injury and segmental glomerulosclerosis (23–26). These findings suggest that although nef may not be pathogenic in all settings, it may modulate nephropathy. Furthermore, transgenic mice that carry HIV-1 long terminal repeat tat and vpr, but not mice that carry HIV-1 genome defective in vpr develop glomerulosclerosis (27). Transgenic mice that carry macrophage-specific c-fms promoter and vpr also develop nephropathy (27). Collectively, these observations indicate that vpr and nef are involved in the pathogenesis of HIVAN, although the specific cell type that is affected directly by these gene products remains uncertain. HIV-1 gene expression has been identified within renal cells, including podocytes, in humans and transgenic mice (19,28–31). In both settings, the podocytes appear dysregulated with loss of differentiation markers, proliferate, and undergo apoptosis (28,32–34). To evaluate the specific role of podocyte injury in HIVAN, we recently generated transgenic mice that carry a podocyte-specific nephrin gene (Nphs1) promoter combined with HIV-1 DNA that lacks gag, pol, and env (35). The mice on an FVB/N genetic background, termed HIV13FVB, developed proteinuria, podocyte injury, collapsing FSGS, and microcystic tubular dilation, indicating that selective expression of the HIV-1 genes in podocytes alone can produce the full spectrum of HIVAN. HIV13FVB mice carry six HIV-1 genes: vif, vpr, vpu, tat, rev, and nef. In this study, we aimed to determine which specific gene causes podocyte damage that leads to HIVAN. Using the nephrin promoter, we generated six series of transgenic mice, each expressing one of the above six genes in podocytes. The results demonstrate that selective podocyte expression of either vpr or nef alone can induce podocyte injury that leads to glomerulosclerosis and that strain background also modulates the phenotype. In addition, our study reveals a prominent synergistic effect of vpr and nef genes on podocyte injury. All DNA fragments that encoded HIV-1 genes were generated from the transgene constructs that were used in our previous studies and were derived from pNL4–3 genomic DNA (Genbank accession no. AF324493; hereafter, nucleotide [nt] number is shown on the basis of these data) (23,35). DNA fragments that encoded nef (nt 8787 to 9407), vif (nt 5041 to 5619), or vpr (nt 5559 to 5849) were generated by PCR. For rev, SalI-XhoI fragment (nt 5785 to 8887) of the mutant B of CD4C/HIV1 transgene construct was subcloned in pBR322. Mutant B construct has an insertion of a stop codon at the NdeI site (nt 6399), which terminates the translation of ENV protein after the 60th amino acid, whereas the length of wild-type ENV is 854 amino acids. For disruption of tat and vpu, the SalI-Acc65I (nt 5785 to 6343) portion was replaced with the fragment that spanned from the initiation codon of rev (nt 5969) to the Acc65I site (nt 6343), which was generated by PCR from the mutant C of CD4C/HIV1 construct (23). This construct carries a deletion of a fragment of nt 6063 to 6100, thus lacking the starting codon of vpu. The resultant SalI-HpaI (nt 8648) fragment contained the exons and the intron of rev (nt 5969 to 8643) with disrupted tat, vpu, and env, thus encoding only rev. A tat fragment was generated from the above SalI-XhoI fragment of mutant B. For disruption of vpu, the SacI-Acc65I portion (nt 5999 to 6343) was replaced with the corresponding fragment of the mutant C of CD4C/HIV1 construct. T at nt 5970 was mutated to C to disrupt the initiation codon of rev. The resultant SalI-BamHI fragment (nt 5785 to 8465) contains the exons and the intron of tat (nt 5830 to 8414) with mutations in rev, vpu, and env, thus encoding only tat. For vpu, the HindIII-Acc65I fragment (nt 6026 to 6343) was used. Three nucleotides that preceded the initiation codon of rev, vif, nef, and vpr were converted to ACC to match Kozak’s consensus sequence. Each of the six DNA fragments was combined with a 5.4-kb promoter fragment of the mouse nephrin gene (Nphs1), internal ribosome entry site, and enhanced green fluorescence protein (EGFP; Figure 1). The Nphs1 promoter contains the first and part of a second exon (up to XhoI site) and the first intron. Two ATG sequences in the Nphs1 coding region were disrupted by site-directed mutagenesis. This promoter segment directed podocyte-specific expression in our previous studies (10,35). Structure of the transgenes. All HIV-1 DNA fragments that were used in our study are derived from an HIV-1 DNA clone, pNL4-3. The structure of pNL4-3 is shown at the top. Nphs1-HIV1 is the transgene that was used in our previous study to generate the HIV13 line, which carries Nphs1 promoter; vif, vpr, vpu, nef, rev, and tat; and a poly A signal from SV40 DNA. env in Nphs1-HIV1 is mutated (×). The six transgene constructs used in this study are shown. Each is composed of Nphs1 promoter, an individual HIV-1 gene (vif, vpr, vpu, nef, rev, or tat), internal ribosome entry site (IRES), enhanced green fluorescence protein (EGFP) gene, and a poly A signal. Nphs1-rev and -tat include the respective introns, with disruptions of env and vpu (×). Nphs1-vpu transgene DNA was injected into fertilized eggs of the FVB/N strain. DNA for Nphs1-rev, Nphs1-tat, Nphs1-vif, and Nphs1-vpr was injected into eggs of F2 hybrid between C57BL/6 and DBA/2. For Nphs1-nef, both strains were used. The transgene integration was examined by PCR, using primers EGFP1 and EGFP2 (Table 1). For the nef:vpr double-transgenic mouse study, transgenes nef and vpr were detected by PCR using the primer pairs nef1 and nef2, and vpr1 and vpr2, respectively (Table 1). Total RNA was extracted from whole kidney and treated with DNase I. RNA was reverse-transcribed using random primers, and HIV-1 genes Egfp and Gapdh (glyceraldehyde-3-phosphate dehydrogenase) were amplified by PCR using the primers listed in Table 1. In addition, a relative amount of nef mRNA to Gapdh mRNA was quantified by real-time reverse transcription–PCR (RT-PCR), using the iCycler and SYBR-Green I assay (Bio-Rad Laboratories, Hercules, CA). The primers for this analysis are shown in Table 1. EGFP fluorescence signal was not detectable in any of the transgenic mice. We performed immunostaining for EGFP using mouse anti-GFP mAb (1:100; Chemicon, Temecula, CA) on paraffin tissues that were heated by microwave. PCR product with nef1 and nef2 was subcloned into pGEM-T Easy vector (Promega, Madison, WI). Plasmid DNA was linearized with SpeI, and 35S-labeled sense and antisense RNA probes were synthesized using T7 RNA polymerase. In situ hybridization was performed as described previously (36). Briefly, hydrated paraffin sections were treated with proteinase K (10 μg/ml) for 8 min at 37°C, fixed in 4% buffered paraformaldehyde for 5 min, incubated in 0.1 M triethanolamine/0.25% acetic anhydride, washed in PBS, dehydrated in serial graded ethanol, and air-dried. The sections then were hybridized overnight at 50°C in buffer (40% formamide, 10% dextran sulfate, 8 mM dithiothreitol, 0.2 mg/ml tRNA, 300 mM NaCl, 10 mM Tris-HCl, 5 mM EDTA, 0.02% polyvinylpyrrolidone, 0.02% Ficoll, and 0.02% BSA) that contained 35S-labeled probe (2 × 104 cpm/μl). Sections then were washed, dehydrated, dried, dipped in photographic emulsion, and exposed at 4°C for 10 d. The sections were developed with D-19 developer (Kodak, Rochester, NY) and counterstained with toluidine blue O. The Institutional Animal Care and Use Committee at Vanderbilt University Medical School and the Animal Experimentation Committee at Tokai University Medical School approved the protocol, in accordance with the principles and procedures outlined in the National Institutes of Health Guide for the Care and Use of Laboratory Animals. All transgenic mice that were analyzed in the study were heterozygous for each transgene. Transgenic mice that expressed tat, rev, or vif were backcrossed with FVB/N two or three times. The number, age, and generation of mice, respectively, were seven (at 4 mo of age in N1 generation), two (2, N2), and six (5, N3) for rev; 10 (4, N1), three (6, N2), and three (6, N3) for tat; and 10 (4, N1) and three (5, in N2) for vif. Seven founder mice that expressed vpu, which were generated in an inbred FVB/N strain, were analyzed at 5 mo of age. The Nphs1-vpr19 line was backcrossed with the C57BL/6 strain for seven generations. In N7 generation, two, six, and three transgenic mice were analyzed at 2, 4, and 7 mo of age, respectively. Transgenic mice in N1 generation were mated with FVB/N mice, generating 32 transgenic offspring. These were analyzed longitudinally. The numbers of mice that were studied at each age were six (at 1 wk of age), two (at 2 wk), one (at 4 wk), six (at 6 wk), seven (at 8 wk), three (at 10 wk), four (at 12 wk), and three (at 14 wk). Some were mated further with FVB/N mice, generating 17 transgenic mice. Four, seven, five, and one mice were analyzed at 2, 3, 4, and 8 wk of age, respectively. The Nphs1-nef10 founder mouse was mated with FVB/N, generating one transgenic offspring (Nphs1-nef10–40). Starting with this mouse, the line was backcrossed with C57BL/6 mice four times. Six transgenic mice of N4 generation were analyzed at 2 mo of age. One mouse of N1 generation was mated with FVB/N three times. Eight transgenic mice of the third generation were analyzed at 2 mo of age. Twenty-four-hour urine was collected using metabolic cages, and 2 μl of urine samples was analyzed by SDS-PAGE using a 4 to 20% gradient gel (Bio-Rad). Increases in albumin and larger proteins were considered as proteinuria, a marker of nephropathy. Plasma was collected when the mice were killed, and the blood urea nitrogen and creatinine were measured in a commercial laboratory. Histologic analysis, immunostaining, electron microscopic analysis, and quantification of glomerular damage were performed as described previously (10,35). Nphs1-nef10–40 was mated with Nphs1-vpr19 mice of N2 generation of C57BL/6 backcrossing. A total of 126 mice were analyzed at 1, 7, 14, 21, and 28 d of age. Glomerular epithelial and mesangial injury indices were determined as previously reported (10). For mesangial changes, score 0 represents no lesion, whereas 1, 2, 3, and 4 represent mesangial matrix expansion, hyalinosis, or sclerosis involving ≤25, 25 to ≤50, 50 to ≤75, and >75% of the glomerular tuft area, respectively. The epithelial cell injury was graded as follows: 0, no lesion; 1, 2, 3, and 4, vacuolization, bleb, or proliferation of epithelial cells involving ≤25, 25 to ≤50, 50 to ≤75, and >75% of the glomerulus, respectively. Six and 13 wild-type mice, four and nine vpr mice, eight and five nef mice, and four and four nef:vpr double-transgenic mice were analyzed at 3 and 4 wk of age, respectively. For all types of mice that were subjected to the study and the parental mice, D3Mit203 genotype was determined by PCR on the basis of the information of the Mouse Genome Informatics database (MGI ID: 706352). Results were expressed as mean ± SE. Data were analyzed by one-way ANOVA followed by least significant difference test or Tamhane’s correction test as appropriate. Differences were considered to be statistically significant at P < 0.05. To identify any HIV-1 gene(s) that causes podocyte damage, we generated six series of transgenic mice that individually expressed vif, vpr, vpu, tat, rev, or nef in podocytes under the regulation of the Nphs1 promoter. We also aimed to establish transgenic lines that show nephropathy. Previous studies by others and us showed a strong predisposition of nephropathy of the FVB/N genetic background (35,37); therefore, establishment of a nephropathic transgenic line on the FVB/N background was thought to be difficult, because mice would die of severe disease before producing offspring. We therefore generated transgenic mice on a mixed genetic background of DBA/2 and C57BL/6, both of which are less susceptible to nephropathy than FVB/N. We then backcrossed them with an FVB/N strain. We generated vpu transgenic mice in inbred FVB/N, because vpu mRNA was not detected in HIV13 transgenic mice and was unlikely to cause nephropathy. Because our previous studies found that penetrance of transgene expression by this promoter is not 100% (10,35), we examined the renal transgene expression by RT-PCR for each HIV-1 gene and/or Egfp and immunostaining for EGFP. The results are summarized in Table 2. Five of six founder Nphs1-vpr mice developed nonselective proteinuria by 8 wk of age (Figure 2). Histologic analysis revealed podocyte damage and FSGS (Table 3, see below). These mice expressed vpr mRNA in the kidney. In one mouse, Nphs1-vpr19, EGFP was detectable by immunostaining that localized to podocytes (Figure 3, A and B). One Nphs1-vpr mouse did not develop nephropathy, and the transgene was not detectable in the kidney of this mouse. Proteinuria in Nphs1-vpr and Nphs1-nef transgenic mice. 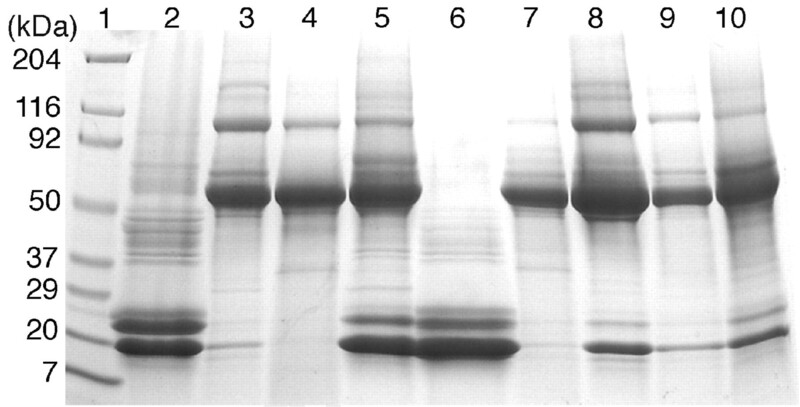 SDS-PAGE analysis of urinary protein. Urine samples (2 μl) from Nphs1-vpr and Nphs1-nef transgenic mice and wild-type mice were analyzed at 8 to 10 wk of age. Samples loaded are molecular weight markers (lane 1), Nphs1-nef10 (lane 2), Nphs1-nef18 (lane 3), Nphs1-nef27 (lane 4), Nphs1-nef149 (lane 5), wild type (lane 6), Nphs1-vpr10 (lane 7), Nphs1-vpr16 (lane 8), Nphs1-vpr19 (lane 9), and Nphs1-vpr21 (lane 10). Proteinuria was detected in Nphs1-vpr and Nphs1-nef transgenic mice but not in Nphs1-nef10 or wild-type mice. Transgene expression. (A and B) Transgene expression in the transgenic line Nphs1-vpr19. The reporter gene product, EGFP, was detected by immunostaining within the glomerulus (A). Staining for synaptopodin on the adjacent section (B) indicates that the transgene is expressed on podocytes. (C and D) Transgene expression in the transgenic line Nphs1-nef10. HIV-1 nef mRNA (C) was detected within the glomerulus. On the periphery of the tuft, the cell type that expressed nef mRNA (arrows) was identified as podocytes from the anatomic location. Sense control probe showed only background signal (D). Magnification, ×400. We obtained 10 Nphs1-nef founder transgenic mice on a mixed genetic background of C57BL/6 and DBA/2. After establishing a transgenic line (Nphs1-nef10 line), we additionally generated 20 Nphs1-nef founder transgenic mice on an inbred FVB/N genetic background. Of the total 30 Nphs1-nef founder transgenic mice, transgene mRNA was detectable by RT-PCR in the kidneys of 11 mice (Table 4). Three of them, Nphs1-nef27, 149, and 162, had proteinuria (Figure 2) and advanced glomerulosclerosis with severe podocyte damage (see below). Nphs1-nef10 developed mild focal mesangial sclerosis with slight podocyte damage at 5 mo of age. The remaining seven mice that expressed nef mRNA did not develop podocyte damage (Table 4). The amount of nef mRNA was quantified by real-time RT-PCR. Nphs1-nef10 had higher expression of nef mRNA than other non-nephropathic Nphs1-nef mice (Table 4). Of note, Nphs1-nef149, 162, and 27, which showed severe FSGS, expressed a lower level of nef mRNA than Nphs1-nef10. In situ hybridization performed on the kidneys of the Nphs1-nef10 line detected nef mRNA on podocytes (Figure 3C). No specific signal was detected with a sense probe (Figure 3D). None of the transgenic mice that carried rev, tat, vif, or vpu developed proteinuria. Nphs1-rev, -tat, and -vif mice were generated on a mixed genetic background of C57BL/6 and DBA/2. Because development of nephropathy in HIV13 transgenic mice depends on the FVB/N genetic background (35), the lack of nephropathy in these mice may reflect a lack of impact of the FVB/N genetic background. To rule out this possibility, we chose founder transgenic mice that expressed the transgene in kidneys and backcrossed them with wild-type FVB/N mice for two (for Nphs1-vif) or three (for Nphs1-rev and Nphs1-tat) generations (Table 2). None of the transgenic offspring in N1 to N3 generations showed nephropathy (Figure 4, I through K). Nphs1-vpu mice that were generated on the FVB/N genetic background yielded seven founder mice that expressed the transgene. However, none of these mice developed nephropathy (Figure 4L). Taken together, these results indicate that vpr and nef cause podocyte injury. By contrast, vif, tat, rev, and vpu are not nephropathic genes. Renal lesions in Nphs1-vpr and Nphs1-nef transgenic mice. (A and B) Wild-type mouse at 4 mo of age showing normal histology. (C and D) Nphs1-vpr19 at 4 mo of age had noncollapsing glomerulosclerosis, proteinaceous casts, and tubulointerstitial injury (C) and vacuolar degeneration of glomerular epithelial cells (D). (E and F) Nphs1-nef149 at 6 mo of age showed noncollapsing focal segmental glomerulosclerosis, tubular microcystic dilation, and interstitial fibrosis (E) and vacuolar degeneration of glomerular epithelial cells (F). (G and H) Nphs1-nef10 at 5 mo of age showed focal casts and focal mesangial sclerosis. (I through L) Nphs1-vif, -tat, -rev, and -vpu mice showed normal renal histology. Magnifications: ×200 in A, C, E, G, and I through L; ×400 in B, D, F, and H (period acid-Schiff staining). Founder mice, Nphs1-vpr8, 10, 16, 19, and 21, showed moderate to severe segmental or global, noncollapsing sclerosis with tubulointerstitial injury (Figure 4). In these mice, nephrin and synaptopodin immunostaining was markedly suppressed. By contrast, desmin was upregulated, indicating that the podocytes were damaged (Figure 5). In Nphs1-vpr10 and 19, podocytes and parietal epithelial cells showed prominent vacuolar degeneration (Figure 4D). In these mice, tubulointerstitial damage was severe, and the tubules were microcystically dilated (Figure 4C). Damage of podocytes in Nphs1-vpr and Nphs1-nef transgenic mice. Wild-type (A through C), Nphs1-vpr19 (D through F), Nphs1-nef149 (G through I), and Nphs1-nef10 (J through L) mice at 4 to 6 mo of age. There was prominent degeneration of podocytes with markedly reduced podocyte markers, synaptopodin, and nephrin in Nphs1-vpr19 (D and E) and Nphs1-nef149 (G and H). In wild-type mice, desmin was faintly detectable only in mesangial cells (C), whereas in Nphs1-vpr19 and Nphs1-nef149, desmin was expressed in podocytes (F and I). In Nphs1-nef10, synaptopodin staining was preserved, but nephrin was slightly decreased. Desmin was stained in expanded mesangial areas. Some podocytes also expressed desmin (arrows). A to C, D to F, H to I, and J to L are adjacent sections, respectively. Magnification, ×400 (synaptopodin in A, D, G, and J; nephrin in B, E, H, and K; and desmin staining in C, F, I, and L). Nphs1-vpr19 founder mouse produced transgenic offspring via mating with C57BL/6 mice. These were mated further with FVB/N mice. We longitudinally analyzed 32 transgenic mice that were obtained through this mating. Before 6 wk of age, most transgenic mice had no proteinuria, and the renal histology was normal. At 8 wk of age, three of 10 transgenic mice developed mild proteinuria and had podocyte damage. After 8 wk of age, all transgenic mice (n = 9) had developed massive and nonselective proteinuria, severe podocyte injury, and segmental or global glomerulosclerosis. We previously observed that HIV13FVB mice showed immature glomeruli at 2 wk of age (35). The pattern of glomerular maturation was normal in the Nphs1-vpr19 mice that were bred on FVB/N once or twice. The Nphs1-vpr19 line was backcrossed with a C57BL/6 strain. Eleven transgenic mice in N7 generation were analyzed at 2 to 7 mo of age. Most mice showed essentially normal renal morphology, with the exception of one mouse, which showed mild focal segmental sclerosis in 20% of glomeruli at 7 mo of age. The Nphs1-vpr8 founder mouse also produced a small number of transgenic offspring when mated with FVB/N. They showed proteinuria and FSGS. Nphs1-nef27, 149, and 162 mice showed advanced noncollapsing glomerulosclerosis with tubulointerstitial injury (Figure 4, E and F). Synaptopodin and nephrin were markedly reduced, whereas desmin was upregulated within the podocytes (Figure 5, G through I). In addition, Nphs1-nef149 and 162 showed remarkable vacuolar degeneration in podocytes (Figure 4F). These three founder mice did not produce offspring. Nphs1-nef10 showed focal proteinaceous casts and mild focal mesangial sclerosis at 5 mo of age (Figure 4, G and H). At 6 mo of age, podocytes showed focal injury with occasional protein reabsorption droplets and detachment from the glomerular basement membrane. Synaptopodin and nephrin were normal or slightly downregulated. Desmin was slightly increased in podocytes of glomeruli with mesangial sclerosis (Figure 5, J through L). Nphs1-nef10 founder mouse generated transgenic offspring. Transgenic mice that were obtained by backcrossing with C57BL/6 strain for four generations and those with FVB/N strain for three generations were compared at 2 mo of age. Of the six transgenic mice with C57BL/6 genetic background studied, two mice showed mild focal segmental glomerular sclerosis, three showed mild mesangial expansion, and the other one was normal. Of the eight transgenic mice with the FVB/N genetic background studied, only one showed mild mesangial expansion, and the other seven were normal. Therefore, mating with the FVB/N genetic background did not augment nephropathy in the Nphs1-nef10 line. Our previous HIV-1 transgenic mice (HIV13FVB) had simultaneous expression of both vpr and nef. To test whether vpr and nef have synergistic effects on podocyte injury, we mated Nphs1-vpr19 and Nphs1-nef10 lines and generated double-transgenic mice (nef:vpr). Compared with transgenic mice that carried either vpr or nef, which had no proteinuria by 4 wk of age, the nef:vpr developed proteinuria by 1 wk of age, which progressed to massive and nonselective proteinuria by 3 wk of age. At 4 wk of age, nef:vpr mice had renal failure with markedly elevated blood urea nitrogen (260.7 ± 33.5 mg/dl; n = 3) compared with wild-type mice (24.5 ± 9.3 mg/dl; n = 4), vpr single-transgenic mice (26.0 ± 7.2 mg/dl; n = 6), and nef single-transgenic mice (24.3 ± 0.58 mg/dl; n = 3). Some nef:vpr mice had ascites. Histologically, none of the vpr or nef transgenic mice had abnormalities by 2 wk of age. Moreover, electron microscopic analysis at 2 wk of age detected no abnormalities in the single-transgenic mice. Eleven of 13 vpr mice and six of 13 nef mice did not have any abnormality by 4 wk of age. The rest of the single-transgenic mice had only mild to moderate mesangial matrix expansion without remarkable podocyte vacuolization. In contrast, by 1 wk of age, two of four nef:vpr mice had remarkable mesangiolysis, dilated capillaries, microaneurysms, and occasionally mesangial expansion and hypercellularity. In addition, one nef:vpr mouse had prominent hyperplastic lesions in the afferent arterioles and interlobular artery. At 2 wk of age, all nef:vpr mice showed mesangial matrix expansion with an increase in type IV collagen (data not shown). Synaptopodin and nephrin were markedly downregulated, indicating that podocytes were severely damaged. By electron microscopy, there was prominent podocyte degeneration with completely effaced foot processes and microvillous transformation (Figure 6). 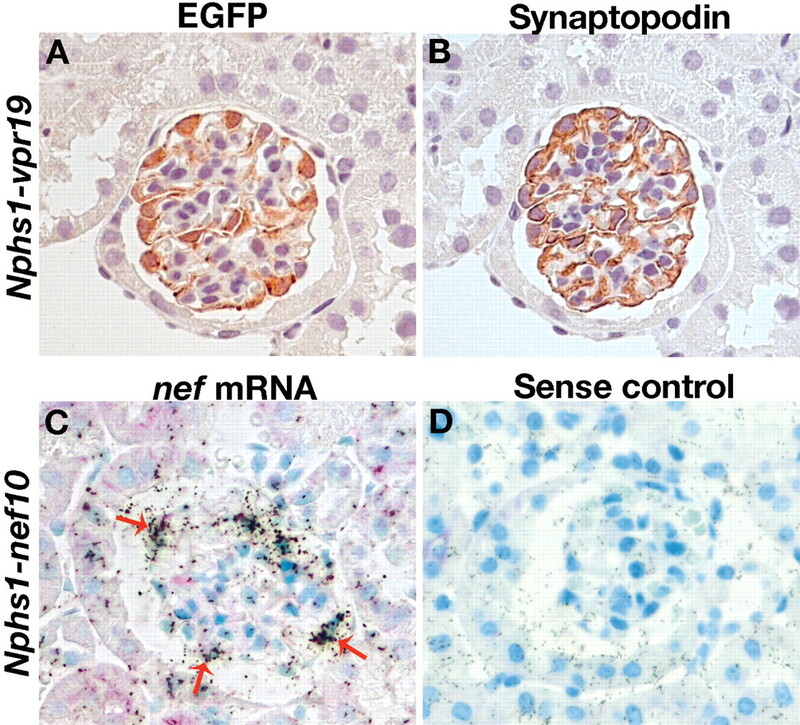 After 3 wk of age, all nef:vpr mice developed severe glomerulosclerosis and tubulointerstitial injury with almost complete loss of synaptopodin staining (Figure 7). Quantitative analysis for glomerular epithelial and mesangial injury at 3 and 4 wk of age is shown in Figure 8. Glomerular ultrastructure of nef:vpr mouse. Electron microscopy of the kidney of a wild-type (A) and nef:vpr double-transgenic mouse (B) at 2 wk of age. In contrast to normal podocytes with fine foot processes in (A), podocytes in nef:vpr showed degeneration with complete effacement of foot processes and microvillous transformation (B). Bar = 2 μm. 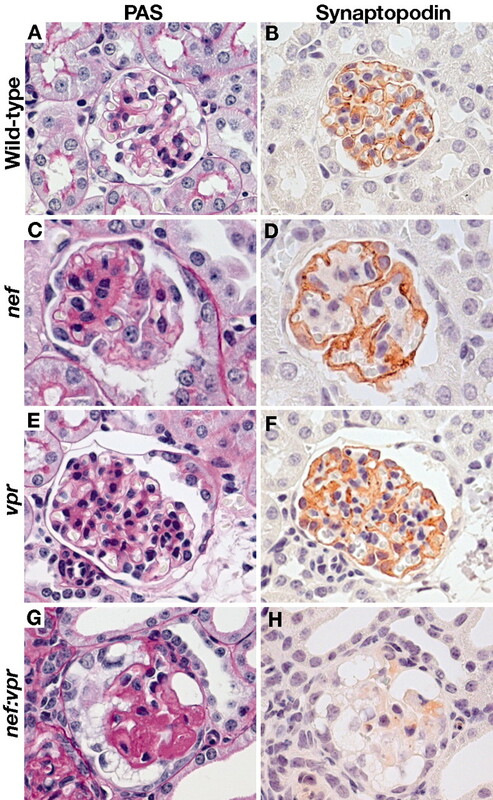 Glomerular histology of vpr, nef, and nef:vpr mice at 4 wk of age. Compared with wild-type (A and B), nef single-transgenic mouse displayed mild mesangial expansion (C) with downregulation of synaptopodin (D). vpr single-transgenic mouse had normal renal histology (E) and normal synaptopodin staining at this age (F). nef:vpr double-transgenic mouse showed global sclerosis with vacuolization in visceral and parietal epithelial cells (G), with dramatically reduced synaptopodin staining (H). A to B, C to D, E to F, and G to H are adjacent sections, respectively. Magnification, ×400 (periodic acid-Schiff [PAS] in A, C, E, and G; and synaptopodin staining in B, D, F, and H). Quantitative analysis of glomerular injury. Indices for glomerular epithelial injury and mesangial injury at 3 and 4 wk of age are shown. 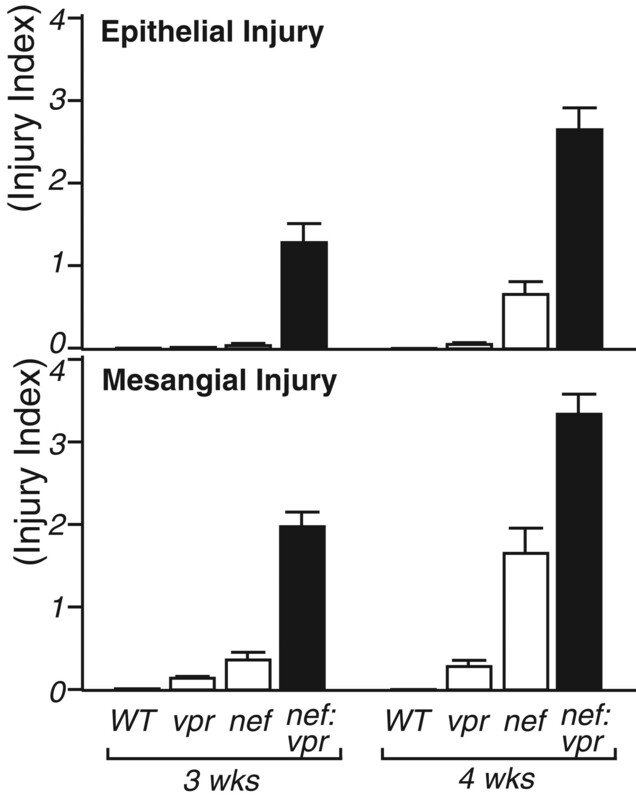 Note prominent epithelial and mesangial injury in nef:vpr double-transgenic mice compared with wild-type (WT), vpr, or nef single-transgenic mice (P < 0.05). Because the nef mouse that was used for generating the double-transgenic mice had the FVB/N genetic background, the possibility existed that the severe nephropathy that was observed in nef:vpr double-transgenic mice was attributed to FVB/N genetic traits. We therefore determined the type of D3Mit203 microsatellite, which is closely associated with the major HIV-1 nephropathy susceptibility locus (37). Both Nphs1-nef10 and Nphs1-vpr19 founder mice were homozygous C57BL/6 type (B6/B6), and the nef mouse that was used for the mating had the B6/FVB type. The vpr mice that were used for the mating had B6/B6 type. Of the 21 nef:vpr double-transgenic mice analyzed, eight had the B6/B6 type and 13 had the B6/FVB type. We found no difference in the degree of renal injury between B6/B6 and B6/FVB types at any age. This indicates that the synergistic effect of nef and vpr had a greater impact on podocyte injury than the major genetic susceptibility factor. It was reported that podocytes proliferate in human HIVAN and Tg26 mice. However, none of the transgenic mice that were generated in this study, including Nphs1-vpr, Nphs1-nef, and nef:vpr mice, showed an appreciable degree of proliferation of visceral epithelial cells. To detect proliferation of injured podocytes, we performed double immunostaining for Ki-67 and desmin, a marker of injured podocytes. To distinguish injured podocytes from mesangial cells, which also were stained for desmin, the localization of doubly positive cells was determined in periodic acid-Schiff–stained adjacent sections. Extensive study in more than 30 transgenic mice with advanced nephropathy found only one doubly positive cell in an anatomic location of podocytes in one transgenic mouse of Nphs1-vpr19 line with the FVB/N genetic background at 3 mo of age (Figure 9). These indicated that podocyte proliferation is a very rare phenomenon in these transgenic mice. Rare podocyte proliferation. One cell (arrow) was doubly stained for synaptopodin (purple in A, brown in B) and Ki-67 (brown in A) in one transgenic mouse of the Nphs1-vpr19 line with FVB/N genetic background at 3 mo of age. PAS staining in the adjacent section (B) confirms that the cell localization also is consistent with a podocyte. Extensive search in >30 transgenic mice found only one doubly positive cell. In this study, we generated six series of transgenic mice, each individually expressing one of the candidate genes of HIV-1, tat, rev, vif, vpu, vpr, or nef, selectively in podocytes. All founder transgenic mice that expressed vpr and four of 11 founder transgenic mice that expressed nef developed podocyte damage. Conversely, none of the mice that expressed vif, tat, rev, or vpu developed podocyte injury. FVB/N genetic background is a prerequisite for the development of nephropathy in the HIV13 transgenic line (35) as well as in the Tg26 line (37). Nphs1-vif, -tat, and -rev were generated in a mixed genetic background of DBA/2 and C57BL/6. We therefore backcrossed with the FVB/N strain for two to three generations. None of the Nphs1-vif, -tat, and -rev mice with the FVB/N genetic background showed nephropathy. We could not detect VIF, TAT, REV, or VPU protein with available antibodies. Therefore, we explored the possibility that these proteins were not generated. We think that this is unlikely, because (1) mRNA and protein of the reporter gene EGFP were detected, (2) mRNA for each HIV-1 gene was detected, (3) these antibodies failed to detect transgene products also in the HIV13 mice, (4) the same Nphs1 promoter segment successfully generated functional proteins in podocytes in our previous studies (10,35,38), and (5) sequencing of the transgene cDNA found no accidental mutation or unexpected splicing. These findings collectively indicate that (1) vpr is a major pathogenic gene causing podocyte damage; (2) nef alone also can cause podocyte damage; and (3) vif, tat, rev, or vpu alone does not cause podocyte damage, although possibilities remain that these gene products may cause or modify nephropathy in other genetic backgrounds. Notably, although nef mRNA was detected by RT-PCR in the kidney of 11 Nphs1-nef mice, only four developed nephropathy. Nphs1-nef mice without nephropathy expressed lower amounts of nef mRNA than did Nphs1-nef10, suggesting that a large amount of NEF is necessary to cause podocyte damage. However, Nphs1-nef mice with severe FSGS also expressed lower amounts of nef mRNA. In these mice, podocytes were severely injured, so the expression of nef RNA driven by Nphs1 promoter may be downregulated. Nevertheless, the possibility still remains that other genetic factors are required for the nephropathy to develop. It is interesting that nef and vpr had remarkable synergistic effects on podocyte injury. Thus, nef:vpr double-transgenic mice developed substantially more accelerated and severe podocyte damage than any transgenic mouse from the Nphs1-nef10 and Nphs1-vpr19 lines. It has been reported that podocytes undergo proliferation and apoptosis in human HIVAN as well as in Tg26 mice (28,32–34). In vitro experiments showed that NEF induces anchorage-independent proliferation and de-differentiation of podocytes through activation of Src-dependent Stat and mitogen-activated protein kinase pathways (39–41). Recently, Husain et al. (42) reported that transgenic mice that expressed nef in podocytes showed expression of Ki-67 in podocytes and downregulation of synaptopodin. These observations suggest that dysregulation of cell cycles or apoptosis may be involved in HIVAN pathogenesis. However, we found essentially no Ki-67–positive podocytes in Nphs1-vpr, Nphs1-nef, and nef:vpr mice. Similarly, we did not observe apoptotic podocytes by terminal deoxynucleotidyl transferase–mediated dUTP nick-end labeling staining in our transgenic mice (data not shown). Taken together, these findings do not support a prominent role for proliferation or apoptosis in the injury of podocytes that was demonstrated in our transgenic mice. Segmental capillary collapse is a morphologic hallmark of HIVAN and has been observed in HIV13FVB mice. In our study, Nphs1-vpr, Nphs1-nef, and nef:vpr transgenic mice did not have collapsing features, suggesting that other HIV-1 genes, including vpu, tat, rev, and vif alone or in combination, may have an impact on producing tuft collapse. Injury of podocytes by immunotoxin did not cause collapsing glomerulopathy (10), indicating that podocyte damage alone cannot cause this phenotype. The mechanism underlying the collapse is an intriguing unsolved question. One nef:vpr double-transgenic mouse showed hyperplastic lesions in the afferent arteriole. It is interesting that the arterial lesions were similar to those observed in angiotensinogen or AT1 receptor knockout mice (43), suggesting that these two different mouse models share a common secondary change in the artery. However, a precise mechanism for development of this lesion is not clear. Genetic background has a strong influence on the development of HIVAN. Black individual are especially susceptible to HIVAN (11–17). Genetic background also influences experimental nephropathy such that the FVB/N genetic background determines renal damage in Tg26 and HIV13 mice (35,37). In Tg26, a major nephropathy susceptibility locus is present on mouse chromosome 3A1 to 3 (37). In our study, mating with FVB/N mice augmented nephropathy in the Nphs1-vpr19 line but not in the Nphs1-nef10 line. Although our study was performed on a mixed genetic background with a limited number of mating, these findings indicate that the vpr gene has a genetic background dependence of nephropathy. We previously showed that HIV13 mice on the C57BL/6 genetic background showed only mild mesangial expansion, which was in a manner similar to Nphs1-nef10 mice. Mild mesangial expansion in HIV13 mice with the C57BL/6 genetic background may primarily reflect the activity of the nef gene. Similar interplay of viral genes and host response, influenced by genetic background, may contribute to the variable manifestations of HIV-1 infection in the kidney in various human populations. Mechanisms by which HIV-1 genes cause nephropathy are not known. VPR is thought to play an important role in the intracellular transport of the HIV-1 preintegration complex and has been reported to affect several cellular functions, including G2 cell-cycle arrest, regulation of apoptosis, transcriptional activation, co-activation of glucocorticoid receptor, ion channel formation, and disruption of cytoskeleton (44). Similarly, NEF has multiple functions, including enhancement of viral infectivity, perturbation of endosome trafficking pathways, and modulation of cell signaling (45). How these cellular mechanisms are modulated in podocytes has not been addressed. Our studies find no definitive proliferation or apoptosis of podocytes. However, even before the onset of proteinuria, podocytes in HIV13FVB mice were devoid of extension of primary processes and foot processes. It is therefore possible that disturbance of the cytoskeleton in podocytes is involved in the development of nephropathy. In this regard, both VPR and NEF have been reported to be associated with cytoskeletal alterations and changes in cell morphology (46–50). Elucidation of molecular mechanisms may also lead to understanding of the pathogenesis of more common glomerular diseases that result in glomerulosclerosis. Our study demonstrates that both vpr and nef play an important role in pathogenesis of podocyte damage and subsequent FSGS. In addition, vpr and nef have a significant synergistic effect on podocyte injury and subsequent development of glomerulosclerosis. This study was supported by National Institutes of Health grants DK37868 and DK447577. Part of this study was presented in abstract form at the 5th International Podocyte Conference, June 18 through 20, 2004; Seattle, WA; and the annual meeting of the American Society of Nephrology; October 27 through November 1, 2004; St. Louis, MO. We thank Dr. Valentina Kon for editorial assistance and discussions and Dr. Kato and Ms. Tsuchida for microsatellite analysis.